Bambudda’s streetside patio is like no other in the city. There’s the bar, compact yet well-stocked. There are six or seven stools outfitted with cushy leather. And there’s Powell Street, literally an arm’s reach away – once the front doors swing open, you’re practically sitting on the sidewalk. Naturally, these seats are a hot commodity given a) the close proximity to alcohol, and b) the close proximity to Bar Manager Robert “Buck” Friend – but more about him in a minute. When the seats fill up – and they will fill up fast, especially in the heat of summer – you have the option of adjourning to Patio Two. Situated at the corner of Columbia and Powell streets, this tucked-away plaza is decked out with festive Chinese lanterns and umbrellas, seats up to 22 people and is prime for colourful people watching. You could easily laze away an afternoon here, sharing a plate of La Mein (mushrooms and king pea tips) and working your way through a playful cocktail list that will in turns elicit disbelief, glee, curiosity and awe (example #1: the Tsui Hang, made with dark rye, Budweiser syrup, iron Buddha tea and Bittered Sling Moondog bitters, served in a delicate China teapot). Bambudda’s nouveau Chinese vibe drives the inspiration behind crazy-inventive cocktails like this – and given that Buck has his fingerprints all over cocktail scenes worldwide, he has no trouble keeping Bambudda’s patrons guessing with a constant rotation of so-out-there-they-work concoctions (example #2: The Boxer, with walnut-infused tequila, Cointreau, lemon, ginger syrup and – wait for it – a chicken skin rim). Born in Australia, Buck moved here after presumably spending his childhood whipping up infusions, tinctures, shrubs and liqueurs, and during his time at Revel Room, Maenam and now Bambudda has quietly built a reputation for his skilled and spirited approach to spirits. For this week’s patio test, we challenged him to come up with a brew worthy of lounging on a sidewalk in deep Chinatown. The result: Bubble Tea, a tongue-popping mix of gin, house-made green tea liqueur, Blue Curçao, lemon and rhubarb bitters. I hop on a stool as Buck slides the aquamarine drink in front of me. Then he tops it with a crown of pink hibiscus bubbles, and I’m sold. 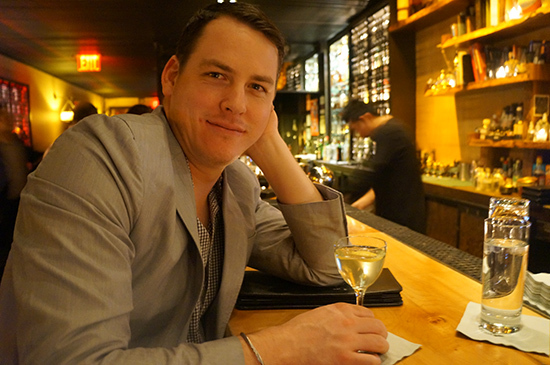 In between sips (sweet hibiscus chased by smooth and tangy citrus – excellent fuel for an evening of patio fun), we have a chat and Buck gives me the lowdown on Vancouver’s cocktail and patio scenes. Drink what you want, when you want. Pretty much. If you want a vodka soda, drink a vodka soda. If you want a shot and a beer, drink a shot and a beer. If you love to drink and work with cocktails, go for it. Just don’t force what you like on someone else and you’ll be fine. We’re all about apothecary cocktails. Do you buy ingredients from the crazy number of herbalists in nearby Chinatown? Considering we’re a Chinese restaurant, I try to source as many ingredients as possible from Chinatown. There’s also a great apothecary in Kits where I get Angelica root and other bases for bitters. Sometimes I have to go online. But buying local is always your most viable option. What makes the Bubble Tea the perfect summer patio sipper? It is! It looks girly, but basically it’s a citrus cocktail that’s easy to drink. Not too sweet, not too tart, not too alcohol-forward. Ice cold, refreshing. You could drink three or four and think, “Man, I’m having a great time.” You won’t stop at just one of these. My chef was looking through a cookbook and jokingly said, “Do something like this.” I said, “Okay.” And it came from there. I had hibiscus syrup lying around, and I like blue drinks. I thought the colours went well together. That’s how I come up with most cocktails. I don’t really have a process. What’s the best patio in Vancouver? In the summer? Keefer Bar. You can fit maybe 15 people around the fire pit. There are around 10 beers to choose from – most of them Asian, which is awesome – and amazing cocktails. And the Rosemary Gimlet is easily one of the most famous drinks in the city. What’s cool and special about Bambudda’s patio? It’s like no other patio in the city. This patio will make you feel like you’re in Mexico. Hold on – let’s open the doors. You’re about to find out.